All of your published social posts to date across all your social media accounts. The historic performance of your various social posts and accounts. The types of social posts that garner the most engagement across all accounts. In the upper right, click Export. Any account, date range, or campaign filters that have been set on the dashboard will not apply to the export. In the dialog box, enter your Email, then click Export. 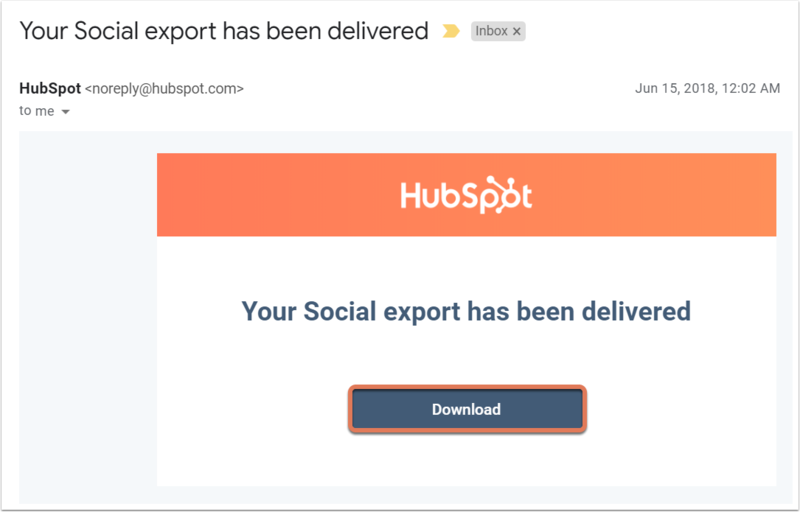 You'll receive an email from HubSpot shortly with the social export in your inbox. Click Download, then save the Excel file to your device. Open the Excel file on your device. Here, you'll see a database of all of the social posts you've published through HubSpot to date. Status: if your post was published successfully or unsuccessfully. Channel: the social network the post was published on. Account: the specific social account the post was published to. Campaign: the name of the HubSpot campaign the post is associated with. Published Message: the content of your post. Here, you can identify common themes, such as words or phrases that get more clicks and interactions. Shortened URL: the shortened URL of any link shared within the post. Original URL: the original URL of any link shared within the post. Clicks: the number of clicks on any link shared within your post. Interactions: the number of interactions with your post, such as retweets, likes, and replies. Channel-specific interactions: the number of interactions with your post specific to the channel, such as Twitter retweets and LinkedIn comments. Publish Time: the date and time the post was published through HubSpot. Created Time: the date and time the post was created in HubSpot.